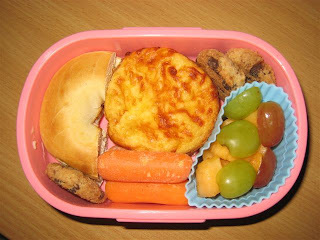 Faith has a smoked chicken & cheese mini quiche, half a toasted bagel with strawberry cream cheese, some carrot sticks, melon & grapes, and a few mini chocolate chip cookies. 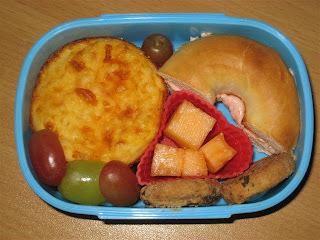 Ben has almost the same--mini quiche, bagel with strawberry cream cheese, canteloupe, grapes and the chocolate chip cookies; no carrots for him, he still has trouble chewing them. I used your recipe and made the mini-quiches my daughter (who is hard to please) just loves them! Thanks for sharing. Mini quiches are such a great idea! My daughter loves them and I know they would go over well in her lunch as well. Thanks for the ideas!